April 2019 - Added a Rogaine sales aid. Added a page on Upjohn shirts. March 2019 - Added an Aphrodisiac bottle to the Caverject page. Added a page on Upjohn cigarette lighters. Added a 1971 sales catalog. Added a new Fun Fact. Added a short story on a morphine sample received by Control. February 2019 - Added 16 examples of Upjohn products. January 2019 - Added two 1983 photos from Upjohn Indonesia. December 2018 - Updated the photos of my Upjohn collection. Added a metal tube of ethyl chloride anesthetic gas. Added a photo of another wooden crate. Created a news section on the home page. Added a 1950 history seminar by Richard Broholm. November 2018 - Added a new page on Upjohn employees and groups today. Added a 1950 article about Upjohn in the Philippines. Added a timeline for the Portage Road Project. Added a page on the 2018 reunion of Upjohn employees in the Philippines. Added a box of Asgrow seeds. October 2018 - Added a 1978 Control News International Technical Edition. Added photos and documents from Crawley Control. Added a page on International QA and on cricket at Kalamazoo. Added a group photo of international managers at Kalamazoo. Added a 1957 article on the farms. Added a 1957 article on the Portage Pilot Laboratory. Added a 1957 article on company cafeterias. Added a 1957 article on computers. 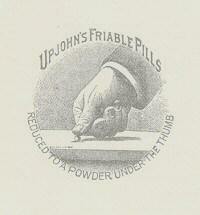 Added a page on unusual jobs at Upjohn. Added another article on the farms. Added articles on finished goods inspection and packaging support. Added more Upjohn Auto Show Off badges. September 2018 - Added a photo album from a 1975 service recognition visit to Brook Lodge. Added a 1972 Upjohn International Division Report. Added a 1970 Agricultural Division Report. Added the 1965 publication Progress Through Science. Added a large embossed mercury bichloride bottle. Added a 1960 article about employees participating in car rallies. Added a 1955 article on making a movie in Building 41. Added an article on airplane clubs that employees belong to. Added another article covering the first mainframe computer. Added a January 1958 Upjohn News article called Guardians of Product Sterility. Added a June 1958 article about preparing for the first mainframe computer. Added a new page for security articles and items. Added a 3-part 1951 article covering sterile product manufacturing. Added a 1951 article on Fine Chem. Added a 1960 article on Fine Chem. Added a 1954 article on Control and a 1954 article on Chemical Engineering. August 2018 - Added Crawley, UK internal newletters No 6, No 7 and No 8. Added a Xanax ashtray. Added a new fun fact about license plates. July 2018 - Added pic of an old wooden box. Added a gold Upjohn CPR lighter. Added the oldest Upjohn binder I've ever seen. Added pic of another old wooden box. Added the Upjohn Award for Fred Heyl. Added a Xanax license plate. June 2018 - Added pics of a Borotal bottle. Added an employee badge for Joseph Ducharme. May 2018 - Added an August 1987 Control News. Added a 1960 article on the public tour escorts. Added the retirement article for Bryant Fullerton and a photo of Scott Aldrich on the Control Other Memories page. Added a 1952 article on old automobiles owned by employees. Added one new product called Buchu and Pareira Brava. Added a couple of pages from 1950s Upjohn New on the Other Memories page. Added a page on Building 91 and Fine Chemical research. Added a pic of a 40-year service award to Robert Polley. Added a Upjohn Int'l shipping chest . Added some photos of a Bacitracin USP steel drum I recently bought. Added a 35-year service anniversary award item. Added a list of Upjohn Award winners from 1938 to 2003.